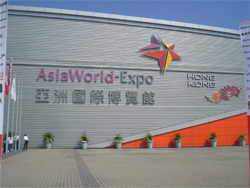 Organised by the HKTDC and Messe Frankfurt (HK) Ltd., Eco Expo Asia takes place at the AsiaWorld-Expo (AWE). The fair is an international trading platform showcasing the latest innovations in environmental protection industries from around the world. Areas of specialty covered at the fair include Air & Water Quality, Eco-friendly Product, Energy Efficiency & Energy, Green Building as well as Waste Management and Recycling.